for children 4-55 lbs. / Birth - 6 years. 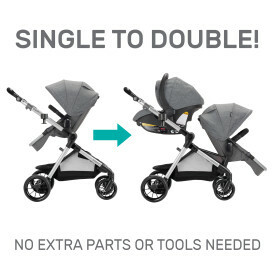 The Evenﬂo Pivot Xpand effortlessly transitions in seconds from a single to double stroller without extra parts or tools - simply slide up and ﬂip out integrated seat mounts to add a second seat! 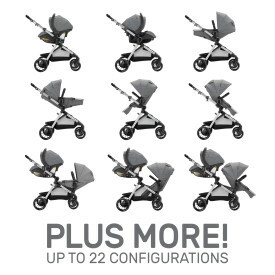 Up To 22 Conﬁgurations! : The unique design accommodates one or two riders. Infants and children can sit at various heights, upright or reclined, in both parent-facing and forward-facing modes. 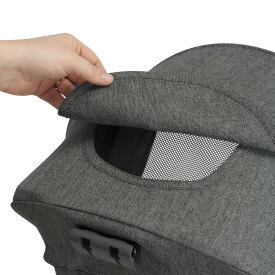 Toddler seat holds up to 55 lbs for extended use. 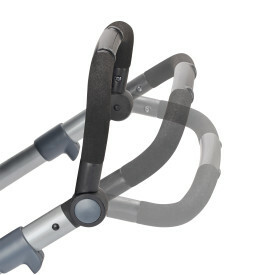 The Evenﬂo Pivot Xpand effortlessly transitions in seconds from a single to double stroller without extra parts or tools - simply slide up and ﬂip out integrated seat mounts to add a second seat! Designed for ultimate ﬂexibility, the frame accommodates up to 22 conﬁgurations, for infant and child seating at various heights in both parent-facing and forward-facing modes. 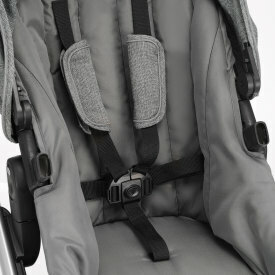 The toddler seat easily converts to infant mode, cradling baby at a comfortable angle and can be used forward or parent-facing. Serious about storage, the Pivot Xpand’s extra-large, easy-access basket expands to over 2 feet in length! 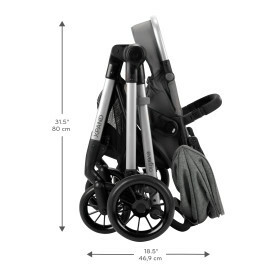 With front and back access for convenience, the stroller’s carrying capacity will be an asset for any outing. 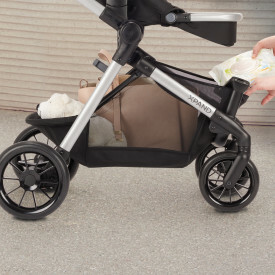 When not in use, the Pivot Xpand folds compactly with the toddler seat attached and self-stands for convenience. Find the most comfortable position for your child with a 3-position reclining toddler seat and 5-position adjustable footrest with extended use up to 55 lbs. Large cruiser tires with front-wheel swivel and rear-wheel suspension provide a smooth ride and superior maneuverability. 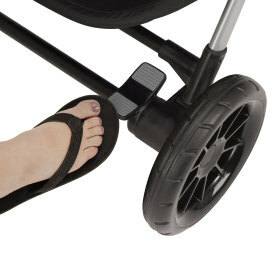 The ﬂip-ﬂop friendly rear brake safely locks wheels in place as you take your child in and out of the stroller. 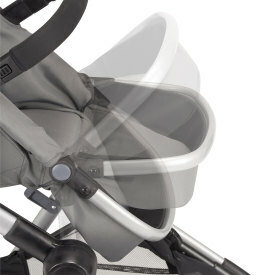 The large canopy shields against sun, wind and rain and a peek-a-boo window keeps baby visible at all times. 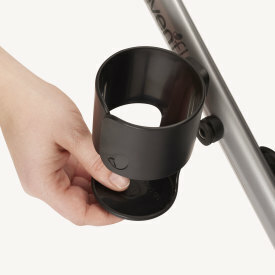 Parents enjoy a 3-position adjustable handle, removable bumper bar, and ﬂex-hold cup holder that ﬁts a variety of beverage sizes to help avoid spills. 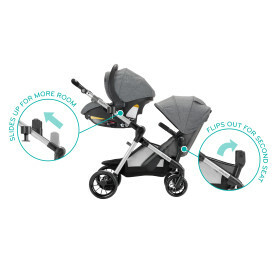 The Pivot Xpand comes with the SafeMax™ Infant Car Seat which can be used in either single or double stroller travel system modes. 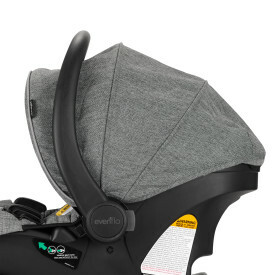 The infant seat is a top safety pick, featuring the exclusive SafeZone™ Base with anti-rebound bar that limits rebound movement in a frontal impact. 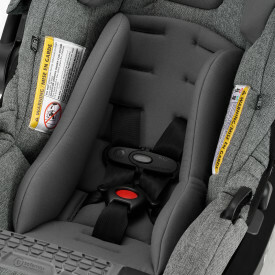 An integrated belt lock-off system, multi-position base and recline indicator help you rest assured that you have a securely-installed car seat. 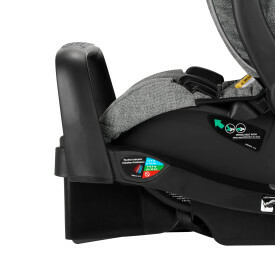 The SafeMax™ Infant Car Seat is proudly tested above industry standards in front, side and rollover impact tests. Weight: Up to 55 lbs. At Evenflo, we continue to go above and beyond government standards to provide car seats that are tested at 2X the Federal Crash Test Standard. Side Impact Tested: Meets or exceeds all applicable federal safety standards and Evenflo’s side impact standards. Designed and tested for structural integrity at energy levels approximately 2X the federal crash test standard. Certified For Use In Aircraft: When used with the internal 5-point harness this restraint meets FAA Inversion requirements for airplane use. Evenflo Temperature Testing: All current Evenflo car seats are tested for product integrity at both high and low temperatures. Read all instructions and warnings on the product, product labels, and instruction manuals before use. 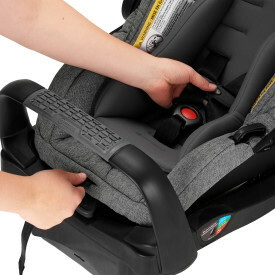 Consult your vehicle owner’s manual to determine proper placement of child restraint in your vehicle and familiarize yourself with your vehicle’s components. Plastic and metal parts may be wiped clean with mild soap and water and dried with a soft cloth. Do not use abrasive cleaners or solvents. Take care not to damage any labels. The harness can be wiped clean with mild soap and water. Allow harness to air dry. 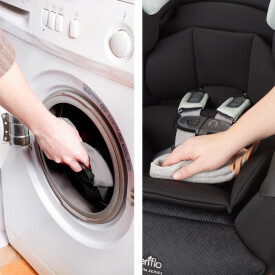 Machine wash the seat pad separately in cold water, delicate cycle. Tumble dry 10 to 15 minutes on low heat. 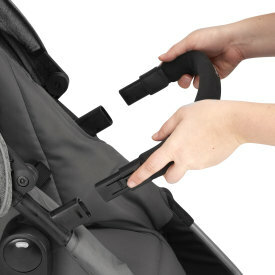 Periodically inspect and clean the restraint's crotch buckle of food, liquids, and other debris to ensure proper latching. Place the buckle in a cup of warm water and gently agitate the buckle back and forth. Press the red button several times while the buckle is in the water. Do not submerge the harness strap. 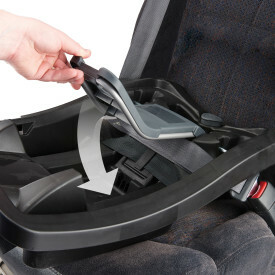 To avoid damage to the buckle, do not clean the buckle with soap or detergents and do not use a lubricant. The unique design accommodates one or two riders. Infants and children can sit at various heights, upright or reclined, in both parent-facing and forward-facing modes. Toddler seat holds up to 55 lbs.